Greenville County will hold possession of the Cyder Cup for the fourth consecutive year following a 19.5 - 12.5 win in this year's matches at Greer Country Club. They held a three point advantage going into Sunday after a strong afternoon performance on Saturday and followed that up with a trail of Sunday Singles wins. Doug Ramey got Spartanburg off to a good start Sunday, but Greenville would take 10 of the next 12 matches. Shane Grumbles won the deciding 16th point for Greenville, finishing just moments ahead of the Bo Leslie & Bobby Hines victories. The four year streak in holding the Cup is a record, although Spartanburg still holds the record for most consecutive Cyder Cup wins with their 3 straight wins from 2005-2007. Greenville won in 2010, then the two Counties halved in 2011, before Greenville won the last two years. The overall series record is now 5-4-1 in favor of Greenville. The first nine years the competition was held at River Falls Plantation before moving to Greer Golf & Country Club this year for the 10th Anniversary Matches. Thanks to everyone who participated in this year's competition including Greenville Captain Terry Willis & Spartanburg Captain Andrew Hewitt and all the players for both teams. In addition to the on course competition, the players and supporters raised over $30,000 as part of the effort to support The First Tee programs in the Upstate. Thank you as well to Greer Country Club and the volunteers who helped make things run smooth with a great facility to play & enjoy. Congratulations to BOTH teams for being honored to play in representing your county as one of the top players, and a hearty thanks and congratulations for making this year's Cyder Cup another huge success!! The 2013 Cyder Cup team has been announced by Greenville captain Terry Willis. The Cyder Cup matches will take place at Greer Golf & Country Club on October 25-26, 2013. This is the tenth year of this event and the series is tied at 4-4-1. 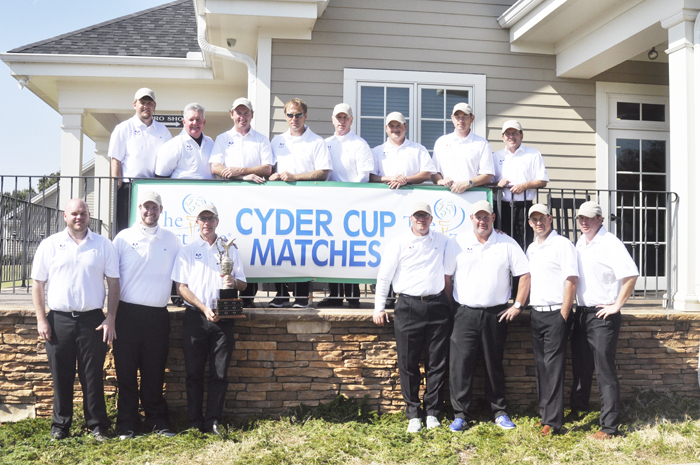 The 2013 Cyder Cup Matches are now set to go at Greer Golf & Country Club October 26-27. The best amateur golfers from Greenville & Spartanburg Counties will be celebrating ten years of great competition, friendships, and the satisfaction of helping a noble cause in their respective First Tee programs. In the nine competitions, each team has won four times along with one draw. In the event of a tie, the Cup is retained by the holder. After winning three of the first four Cups, Spartanbug has seen Greenville hold the bragging rights four of the last five years, including the last three in a row. The first nine competitions were held at River Falls Plantation before moving to Greer for this year's event. Ironically, the Greenville/Spartanbug County line runs across #10, #6, #7, and #8 fairways. If you walk into the golf shop you will cross the county line as you approach the counter. The public is invited to come watch either on the course or from the rocking chairs on the porch at the beautiful Greer CC clubhouse. Play will begin at 7:50 Saturday with two man best ball competition with eight matches. Starting at 12:40 there will be eight more matches of modified alternate shot format. Each match is worth one point to the winner. A halved match nets each team 1/2 point. On Sunday there will be 16 head to head matches worth one point each. There are a total of 32 points available and since Greenville currently holds the Cup they will retain it by winning 16 or more points. Spartanburg on the other hand must win it outright with 16 1/2 or more to take home the Cup. Both teams have been hard at work raising funds for their First Tee programs as well as practicing hard as they represent their county banners. Come watch some great golf and support your favorite county at the 2013 Cyder Cup Matches!